We are an authorized dealer of Saratoga Spas here at Finger Lakes. Made locally in Latham NY, Saratoga Spas has consistently been a quality product for us. Not only quality in the manufacturing, but in the customer service that they offer when backing their product. You will find many similarities between different manufacturers as you do your homework inquiring with each dealer on their spas. It is the customer service after the purchase that we set high standards on here at Finger Lakes. 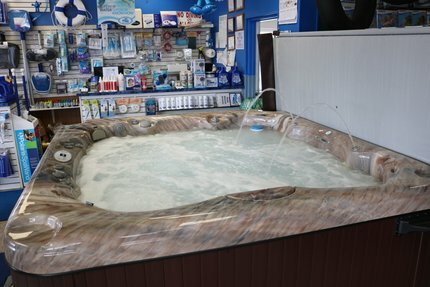 Not only will you find our Saratoga spas to be luxurious and economical, but you will find that our knowledgeable staff is here to back our product with advice and future service thereafter. In house we have a few of our most popular options and color options so that you can find the model that best fits you. Tuff Spas are revolutionizing the hot tub industry by mixing hydrotherapy, performance and durability. This is what sets Tuff Spas' hot tubs from all the others. Here at Finger Lakes Pools we carry all different sizes and price ranges of the Tuff Spas. Click Here to check out the complete line up that Tuff Spas offers. A Tuff Spa will be a great addition to any yard or patio. The durable construction and portibility of these tubs ensures that you can enjoy the spa right away, and for years to come.